For other uses, see Broccoli (disambiguation). Broccoli is an edible green plant in the cabbage family (Brassicas) whose large flowering head and stalk is eaten as a vegetable. The word broccoli comes from the Italian plural of broccolo, which means "the flowering crest of a cabbage", and is the diminutive form of brocco, meaning "small nail" or "sprout". Broccoli is classified in the Italica cultivar group of the species Brassica oleracea. Broccoli has large flower heads, usually green in color, arranged in a tree-like structure branching out from a thick, edible stalk. The mass of flower heads is surrounded by leaves. Broccoli resembles cauliflower, which is a different cultivar group of the same Brassica species. Combined in 2016, China and India produced 73% of the world's broccoli and cauliflower crops. Broccoli resulted from breeding of cultivated Brassica crops in the northern Mediterranean starting in about the 6th century BC. Since the time of the Roman Empire, broccoli has been commonly consumed, and is eaten raw or cooked. Broccoli is a particularly rich source of vitamin C and vitamin K. Contents of its characteristic sulfur-containing glucosinolate compounds, isothiocyanates and sulforaphane, are diminished by boiling, but are better preserved by steaming, microwaving or stir-frying. In 2016, global production of broccoli (combined for production reports with cauliflowers) was 25.2 million tonnes, with China and India together accounting for 73% of the total (table). Secondary producers, each having one million tonnes or less annually, were the United States, Spain, Mexico and Italy (table). In the United States, the US Department of Agriculture reported that national production just of broccoli in 2014 was 0.95 million tonnes, nearly all of which was grown in California. A 100 gram reference serving of raw broccoli provides 34 calories and is a rich source (20% or higher of the Daily Value, DV) of vitamin C (107% DV) and vitamin K (97% DV) (table). Raw broccoli also contains moderate amounts (10–19% DV) of several B vitamins and the dietary mineral manganese, whereas other micronutrients are low in content (less than 10% DV). Raw broccoli is 89% water, 7% carbohydrates, 3% protein, and contains negligible fat (table). Boiling substantially reduces the levels of broccoli glucosinolates, while other cooking methods, such as steaming, microwaving, and stir frying, have no significant effect on glucosinolate levels. ^ Buck, P. A (1956). "Origin and taxonomy of broccoli" (PDF). Economic Botany. 10 (3): 250–253. doi:10.1007/bf02899000. Retrieved 24 April 2012. ^ Stephens, James. "Broccoli—Brassica oleracea L. (Italica group)". University of Florida. p. 1. Retrieved 14 May 2009. ^ "broccoli". Merriam-Webster's Collegiate Dictionary (11th ed.). p. 156. ISBN 978-0-87779-809-5. Retrieved 9 April 2014. ^ a b c "Broccoli (and cauliflower) production in 2016, Crops/Regions/World list/Production Quantity (pick lists)". UN Food and Agriculture Organization, Corporate Statistical Database (FAOSTAT). 2017. Retrieved 31 October 2018. ^ Maggioni, Lorenzo; Bothmer, Roland; Poulsen, Gert; Branca, Ferdinando (2010). "Origin and Domestication of Cole Crops (Brassica oleracea L.): Linguistic and Literary Considerations". Economic Botany. 64 (2): 109–123. doi:10.1007/s12231-010-9115-2. ^ Nonnecke, Ib (November 1989). Vegetable Production. Springer-Verlag New York, LLC. p. 394. ISBN 978-0-442-26721-6. ^ a b Nugrahedi, Probo Y.; Verkerk, Ruud; Widianarko, Budi; Dekker, Matthijs (2015). "A Mechanistic Perspective on Process-Induced Changes in Glucosinolate Content in Brassica Vegetables: A Review". Critical Reviews in Food Science and Nutrition. 55 (6): 823–838. doi:10.1080/10408398.2012.688076. ISSN 1040-8398. PMID 24915330. ^ Dixon, G.R. (2007). Vegetable brassicas and related crucifers. Wallingford: CABI. ISBN 978-0-85199-395-9. ^ "California Drought: Crop Sectors". US Department of Agriculture, Economic Research Service. 3 February 2017. Retrieved 25 April 2017. ^ Smith, Powell (June 1999). "HGIC 1301 Broccoli". Clemson University. Retrieved 25 August 2009. ^ Liptay, Albert (1988). Broccoli. World Book, Inc.
^ Takeguma, Massahiro (26 May 2013). 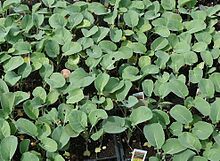 "Cultivo da Couve Brócolis (Growing Sprouting Broccoli)". ^ editors, J. Richard and Joan E. Heitzman; Jim Rathert, principal photographer; Kathy Love and LuAnne Larsen, (1996). Butterflies and moths of Missouri. Jefferson City, MO: Missouri Dept. of Conservation. ISBN 1-887247-06-8. Wikimedia Commons has media related to Broccoli. Lee, Lisa-Ann (22 February 2017). "Creating a broccoli for all seasons to hedge against climate change". newatlas.com. Retrieved 26 February 2017. This page was last edited on 24 April 2019, at 20:01 (UTC).